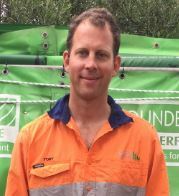 Toby has spent many years in the industrial services and rental industry. He is passionate about quality customer service and problem solving. When not at work, Toby enjoys spending time with his wife, two daughters and Jack Russell “Dozer”.